In case you missed them, some of the best reads on crisis comms, digital strategy and charity content from last month. Charities have been in the headlines ever since the start of the year (Oxfam, President’s Club, Oxfam again, Jo Cox Foundation). There’s lots we can learn from these events in terms of how we need to respond to a crisis and rebuild trust. This from Jon Ware about involving the social team in crisis comms is excellent – Is your social media response helping during a crisis? And this about what it is like to be inside a major crisis by Outrageous Impact. Plus this – after Oxfam, charities are no longer untouchable by Vicky Browning of ACEVO – in which she tackles the public call for charities to be transparent while resenting money spent on admin. It’s worth noting that it’s not just Oxfam who have been effected by this story. NCVO have been working tirelessly to share safeguarding best practice and represent the sector in media interviews. Dr Simon Davey says that charities can no longer be digitally defiant and argues that digital doesn’t have to be difficult. Read about the digital journey of Parkinson’s UK. The digital team at CRUK’s blog is a good read. Find out about their approach to user centric digital learning and development. Test. Test. Test. You are not the user. A useful reminder about the false consensus effect from NN group. Macmillan’s Senior Digital Editor, Rebecca Cryan, talks about accessibility audits. Seb Baird from Time to Change shared insights from this year’s #TimeToTalk day in which they shared over 40 pieces of unique content across different social channels. Benchmark your stats with the new (subscription needed) Charity Comms Digital Benchmark! Based on data from 46 charities. #WorldCancerDay is a big day for lots of health charities. Macmillan launched this lovely #LittleActsOfKindness video. I really liked the way they displayed the subtitles. In addition to the usual fundraising and bad poems, there were some harder-hitting Valentine’s Day charity comms. None quite as cringy as the DWP’s festive message though thankfully. How can you use your archive to connect with topical stories? There were lots of charities marking the 100 years since (some) women got the vote. Age UK told the story of one of its founders Eleanor Rathbone. I am a sucker for maps and data. These examples of (non-charity) content marketing campaigns using maps could give food for thought. How can you use your data to tell a bigger story? This blind Twitter user’s plea which has now had 179k likes seems to have done so much more to raise awareness about image accessibility than any charity or Twitter themselves. Have you changed your settings? This guide to getting alt text right is a must-read if you are new to describing images. Good to see Doncaster Council’s Chief Executive maintaining the gif standards in her comms. Never swallow a bombardier beetle. Urgh! Take a moment to appreciate police dog Max’s hair. I spent January doing an interim comms manager role as well as going to BarCampNFP and SMEX18 so might have missed other good stuff. What did you read / watch / produce this month? Please do share. Did you miss November 2017’s round-up? Catch up with more good reads! My top reads for October. Catch up with this bumper month! October was hashtag-tastic! We had #WorldTeachersDay, #WorldMentalHealthDay (see Third Sector’s series), #WorldOsteoporosisDay, #InternationalDayOfTheGirl, #WorldHomelessnessDay, #WorldSightDay and #WorldPorridgeDay. It was Breast Cancer Awareness month, #HospiceCareWeek, It was also the month that the #RoundPound went out of use and many of us got our #FirstTenner. It was also a month of great charity content and useful reads. There were some great nonprofit Halloween tweets this year. There were lots of creative fundraising, campaigning or silly examples. The Met Office spooky forecast and Time to Change’s stigma-free Halloween campaign really stood out. The Salvation Army produced a powerful new animation about modern slavery. YWCA Scotland released their list of 30 inspiring women under 30. Each day in November they are sharing their stories. Follow them on Twitter (and via #30under30) or directly at their blog. ACEVO are 30. To mark the occasion they are running 30 things to think about during November. The brilliant @nhs account celebrated its first birthday. Some of the tweets from the children’s dentist week were particurly grim (like this one of a jar of teeth – don’t look if you are squeamish). Breast Cancer Now made personalised gifs (and this cheering one) for Wear it Pink supporters. See Joseph Freeman’s article in UK Fundraising for more information about it. St Joseph’s Hospice launched their Impact Report which is told through the eyes of patient Mary. How does your charity deal with social media harassment? Erin Longhurst’s post on JustGiving includes a useful flowchart. See also this about how @GiveBloodNHS responded to a racist comment. 3 Google Analytics reports to help drive digital marketing decisions by Fran Swaine on CharityComms. How charities can work with tech companies on GdnVoluntary. Sad charity video – does it still work? Magneto Films look at three alternative methods. 13 fantastic places to find background music for your video content on BufferSocial. 3 reasons why small charities should embrace digital by Felicity Christensen on JustGiving. Catch up with slides from CharityComms’s recent Digital Conference. How GDS are making accessibility clearer and easier. 8 old-school SEO practices that are no longer effective on moz.com. Just seven months to go until GDPR. There’s lots to read. Try this 10-step guide from the Institute of Fundraising, this webinar from NCVO, this post from Reason Digital and resources from the ICO who recently launched a helpline for small organisations (0303 123 1113). Want more? Read JustGiving’s 10 things you should read this month. 5 things digital leaders do differently by Zoe Amar. Richard Sved wrote a spot-on post about comms for short attention spans using another 80s reference – Waiting for Bono. Each of your social media accounts is a hackers dream, how many do you have? asked Paul Newton on comms2point0. New for older at AgeUK by Lara Burns. If you missed Being the Story, read my blog post about the event – cathartic and powerful storytelling. Macmillan celebrated their charity number (261017) day (26 October 2017). How blood groups work by @GiveBloodNHS. Twitter competitions between institutions – cathedrals for #WorldArchitectureDay and museums for #AskACuratorDay. I love these selfies taken in a photography studio in Birmingham in 1979. And this gif from the Mary Rose Museum. And this image for #WorldPastaDay plus the 1957 BBC April Fool of spaghetti harvesting. Someone donated an ancient tin of soup to Cardiff Foodbank. And Heinz didn’t really enter in to the spirit of things. Louis Theroux recorded a programme name created by the @louistherouxbot. November is sure to be busy too with #TrusteesWeek (13-17 Nov), #OurDay (for local government on 21 Nov) and #GivingTuesday (28 Nov). Plus all the preparations for Christmas fundraising and fun. If you are thinking about seasonal content, read my post about digital advent calendars. What did you read or see in October? Do share your highlights. Did you miss June’s round-up? Catch up with more good reads! Catch up with this week’s news, hashtags and creative content. This week it was 50 years since Cathy Come Home was broadcast. It inspired charities such as Crisis to be set up. It is currently available to watch on iplayer until the start of December. It is also worth listening to After Cathy which was on Radio 4, sharing stories of people experiencing different types of homelessness now. John Lewis released its advert of bouncing animals. This year they are working with the Wildlife Trusts, although you wouldn’t know it from the advert. Sainbury’s and Aldi’s adverts at least had the charity logos showing at the end. In contrast Pret didn’t make a swanky, tear-jerking ad but produced a film showing their work around homelessness. A CAF poll says that #FirstFiver generated an amazing £12.5m in donations. Did you see this note sent to Age UK? 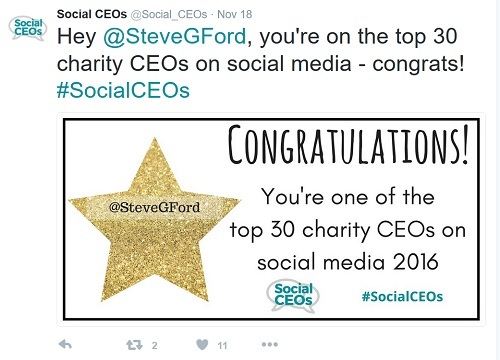 The list of top #SocialCEOs was announced this week. The full list is on Zoe’s SocialCEOs blog post and tips were published on the Guardian Voluntary Sector Network. I liked the stars used to congratulate the individual winners. Over the last 18 months I have been working with the British Society for Haematology and helped them to transform from this to this. Their new website and brand launched last week. Charity Comms’ Burst the Bubble was about finding audiences away from the filter bubble. Civil Society’s #charitytech16 (see the full programme and Mary McKenna’s call to action). #OurDay is the annual chance for councils across the country to showcase their work. Mole Valley District Council won my vote for their use of double topical hashtag, sharing their day with a #MannequinChallenge! And many charities are now joining in the with #MannequinChallenge including RNIB (with voice over) and St John Ambulance (with campaign message). Read Kirsty Marrin’s latest Third Sector article to find out more about this slightly odd meme. I like Oxfam’s Give A Shift campaign including this behind the scenes celebrity film. 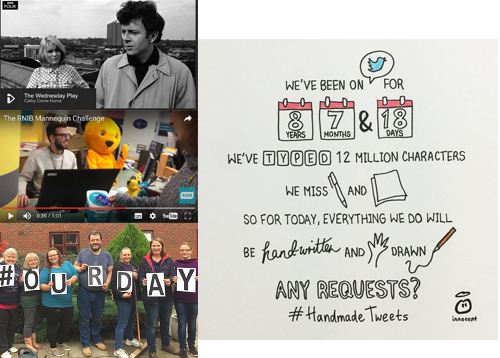 I enjoyed Innocent’s #handmadetweets as a great example of creative and interactive content. The biggest piece of content I have been looking at this week is JRF’s mighty manifesto to solve UK poverty. Amazing piece of work. Am looking forward to taking a closer look at Christmas campaigns. In the meantime, here are some digital advent calendars from last year. Feels like it has been a full-on week, especially in the lead-up to Christmas. What were your highlights this week? Please do share via the comments box.